Some feel happy now but that makes them less happy later. Some feel unhappy now but that makes them feel happy later. Some feel unhappy now and that makes them feel unhappy later. The lucky ones feel happy now and later. Obviously there are shades of all of these possibilities but the chart below is a good way of plotting your actions, feelings and choices and relating to the whole of their impact not just the part you want to see. So where are you now of this chart? 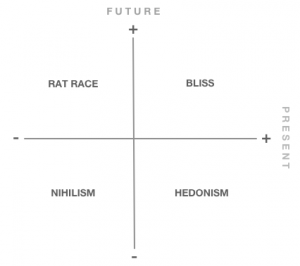 Are you feeling hedonistic? Nihilistic? Stuck in the rat race? Or blissfully happy? 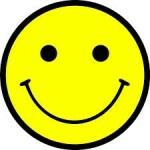 As Tal Ben Sahar says in his classic book Happier: Can you learn to be Happy? Attaining lasting happiness requires that we enjoy the journey on our way toward a destination we deem valuable. Happiness is not about making it to the peak of the mountain nor is it about climbing aimlessly around the mountain; happiness is the experience of climbing toward the peak. In other words, living mindfully with purpose. Wellbeing with welldoing.